I've mentioned over the last 5 weeks that I'd finally got my hands on some Essie nail polishes and have developed such an admiration for the brand. One of the new collections that have been launched from Essie is the Mirror Metalics Collection of nail colours. 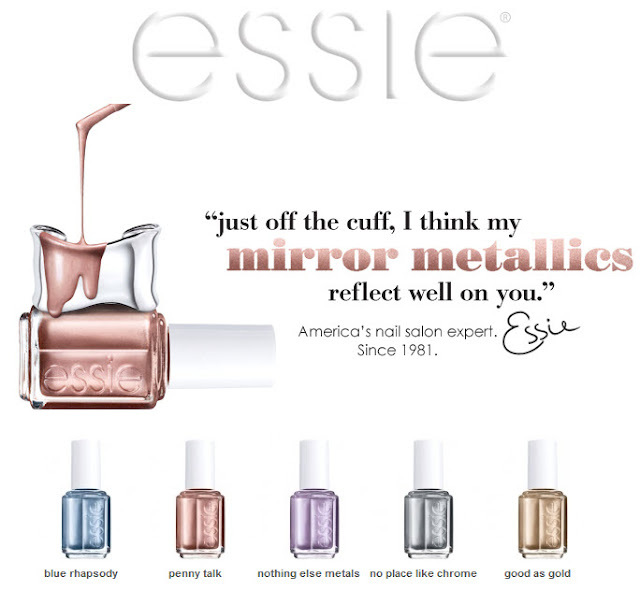 One thing I think many people are unware of is that Essie Nail polishes are DBP, Toluene and Formaldehyde free. When I wear nail polishes and even base coats with Formaldehyde in them my nails discolour horribly and I have since stopped wearing certain nail polishes due to this. It made my nails weak and they'd break right into the nail bed. Since switching to brands like Essie, Tip Top Nails and Mavala the condition of my nails has improved dramatically.